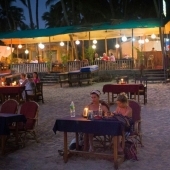 Goan Cuisine, food in goa, south India, fresh fish and sea food, Indian spices - restaurants in Goa and restaurants in palolem. 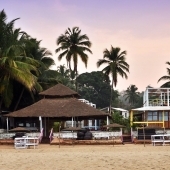 Goa is a food lover's paradise, offering a taste tour of Indian cuisine, alongside local specialities, fantastic fresh seafood and tropical fruits, as well as international food options to suit the palates of its two million visitors. 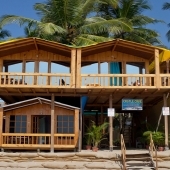 The food in Goa, as with anywhere in the world, is influenced by location and climate. This small coastal state relies heavily on fishing, so seafood is a major part of the diet. The land is planted with coconut palms and rice paddies, and so coconut (oil, milk, cream and alcohol) is an important ingredient in Goa recipes, and rice is the staple food. Various spices are used to give the food its intense flavours. However, what makes Goan food so distinctive is that it is also heavily influenced by history. 450 years of colonization resulted in Goan cooking absorbing a strong Portuguese flavour. Local seafood, coconut, and tangy kokum were combined with palm vinegar (unknown elsewhere in India), chillies and cashew nuts (introduced by the Portuguese) and meats, especially pork, to produce one of the world’s original fusion foods. To this day, Goan ‘fish curry rice’ - freshly caught fish, such as mackerel, in a hot and sour coconut gravy - is a daily meal. Unlike much of Indian cuisine, Goan cooking uses a lot of meat and fish. Goan Catholics in particular have been heavily influenced by their Portuguese heritage, with famous fusion dishes including vindaloo, traditionally prepared with pork and vinegar, spicy chouriço sausages, and chicken xacuti with chillies and coconut milk - all dishes whose names and ingredients have their origins in Portuguese cuisine, but with a Goan twist. Mol De Peixe (fish pickle) and Balchao (prawn pickle) are popular accompaniments. The catch of the day may include kingfish, pomfret, shark and mackerel, with seafood including crabs, prawns, oysters and squid. Seafood can be cooked in sour and spicy sauces such as ambot tik, or more delicate coconut based masalas, rava fried in semolina flour, or baked in a tandoori clay oven. And for dessert, the Indo-Portuguese blend is again evident in Goa’s most famous pudding bebinca, a rich, layered egg custard with coconut. If you’re hungry but don’t want a full meal, are on a tight budget, or just want to explore eating like a local, then a local dhaba or street food cart is the perfect food pit stop. Street food carts can be found in most towns in the evening, serving anything from chouriço sandwiches to deep fried chillies. In India’s only beef loving state, beef Chamuças (a type of samosa) and beef croquettes are also a common sight. Another firm favourite is the Raos Omelette, dipped in a spicy coconut-based gravy and garnished with lime and onions. And every Goan village will have a dhaba serving chai and bhaji-pao - a pea and potato curry with local bread - for breakfast. While it’s worth seeking out some authentic Goan food whilst on holiday, restaurants in Goa cater to all tastes and palates - from budget south Indian Udupis dishing up vegetarian classics such as masala dosa to high-end establishments serving gourmet mediterranean food. However, most of the time you will probably eat at local beach shacks, or your beach resorts in-house restaurants, offering fresh fruit smoothies, snacks, Indian curries, and fresh seafood on the bbq. And if you crave a taste of home, whether that’s Tel Aviv, London or Berlin, then a number of expat run cafes can satisfy your craving for hummus, fish & chips or just a really good cup of coffee. 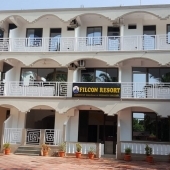 Goa’s popularity as a holiday destination is boosted by having the lowest rates of tax on domestic alcohol in India, from famous Kingfisher beer and Old Monk rum to a wide range of wines and spirits. Goan Porto, a sweeter less refined version of its Portuguese namesake, can be found everywhere, alongside feni, the local speciality made from cashew nuts or coconuts. Every bar will have its distinctive own feni, whether double distilled or flavoured with spices, but beware - it’s an acquired taste and extremely potent! For non-alcoholic refreshment, popular local drinks include Badam, an almond milk, or sweet yoghurt lassi, as well as the ubiquitous chai and fresh coconut water. But on the beaches you’ll find a wide range of refreshing drinks, including lots of tropical fruit juices, and imported alcohol alongside the local alternatives. 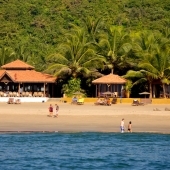 So why not invent your own cocktail and continue Goa’s rich history of flavour fusion!